The Taínos were an indigenous people that lived in the Americas before Columbus arrived there. They came from the Caribbean coast of South America. Around 1200 CE, they moved northward to the island chain of the Lesser Antilles and the Greater Antilles. When Christopher Columbus came to the Americas, the Taínos were living in the Bahamas, the Greater Antilles (Cuba, Jamaica, Hispaniola and Puerto Rico), and some islands of the northern Lesser Antilles. Their culture was different from the culture of the Arawak people (another indigenous group of South America). They were the first people that the Spanish met in the Americas. The name Taíno was given by Columbus. When he met some native men, they said "Taíno, Taíno", meaning "We are good, noble". Columbus thought that Taíno was the name of the people. Rouse divides the Taínos into three main groups. One is the Classic Taíno, from Hispaniola and Puerto Rico. Another is the Western Taíno or sub-Taíno, from Jamaica, Cuba (except for the western tip of the island) and the Bahamas. The third is the Eastern Taíno, from the Virgin Islands to Montserrat. The Taínos of the Bahamas were known as the '"Lucayan". (At that time, the Bahamas were called the Lucayas). Lucayos were Taínos, but their culture was less developed. Archeologists call them "sub-Taínos". The Taínos' ancestors went from the center of the Amazon Basin to the Orinoco Valley. From there, they went through Guyana and Venezuela and got to the Caribbean islands. A different theory says that the Taínos' ancestors came from the Colombian Andes. The Taíno culture developed in the Greater Antilles. Dujo, a chair of wood made by Taínos. Taíno society was divided into two classes. There were the naborias (common people) and the nitaínos (nobles). Both classes were governed by chiefs known as caciques. The caciques could be either male or female. There were also bohiques (medicine men). The Taínos lived in villages called yucayeques. The villages in the Dominican Republic and Puerto Rico were the largest. The villages in the Bahamas were the smallest. The Taínos built large round houses called bohio, where several families lived. The cacique and his family lived in a rectangular house called caney. People slept on cotton hammocks (hamacas). The Taínos often played a ball game called batey. Batey was also the name of the place where they played and had dances. The cacique sat on a chair of wood called duho, or dujo. Caguana Ceremonial ball court (batey), outlined with stones. Taíno zemí sculpture from Walters Art Museum. 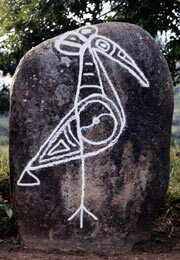 Rock petroglyph overlaid with chalk in the Caguana Indigenous Ceremonial Center in Utuado, Puerto Rico. Taíno Facts for Kids. Kiddle Encyclopedia.